The Man Behind the 'Piggly Wiggly' Song Meet the man behind the music in this week's Hidden Kitchens story, and listen to more tidbits gathered by The Kitchen Sisters along the road. We know everyone who heard this week's story, on unusual uses of the George Foreman Grill, wants to know who sang the song in the background, "Groceries on my Shelf (Piggly Wiggly)." That's Robert Shaw, the Texas barrelhouse piano player, recorded live in 1963 for the album The Ma Grinder, released by Arhoolie Records. Listener Bryan Gordon, a director and screenwriter, grew up in Dover, Del. Gordon recalls Mr. Bronson, who traveled in his pickup truck loaded with a pickle barrel, a scale and food from his deli, bringing corned beef and rye to the few Jewish families on his long, two-lane route through the small cities of lower Delaware and Virginia. Some tips from writer Phyllis Richman, former Washington Post food critic and author of three mystery novels — The Butter Did It, Murder on the Gravy Train and Who’s Afraid of Virginia Ham. Shaw was born in Houston and owned Shaw's Food Market and Barbeque on Manor Road in Austin. As a teen, he worked cattle on his father's ranch, learned butchering and barbequing and started playing piano. 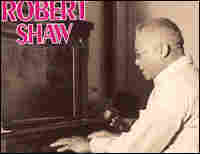 Drifting with seasonal labor gangs, Shaw played piano joints during the south Texas cotton-picking season. After many brushes with the law in a life on the road, Shaw decided barbequing would provide a simpler life. He opened an ice house in east Austin, sold BBQ, held dances and played piano to entertain the customers — a continuous version of the traditional "country suppers" he had grown up with.